"I am honoured to play host to my friend and brother, the executive governor of Ekiti State, Peter Ayodele Fayose. The visit of Gov. 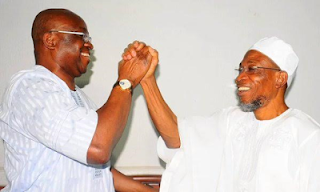 Ayo Fayose to Osun State shows that though we differ politically, the Yoruba race remains united. I celebrate you for the maturity and clear headedness that your visit to Osun today represents. I gave Fayose my word that i will continue to work with him and other Yoruba leaders to better the life of the average Yoruba man"